The Beast Stone is located near the east side of Solstheim, south of the Skaal Village, in the Felsaad Coast region. 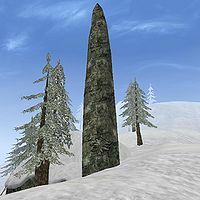 If you follow the east bank of Lake Fjalding and continue north you should shortly run into or see the spire of the stone. The Beast Stone is one of the six All-Maker stones sacred to the Skaal and is involved in The Ritual of Beasts. The Good Beast, a snow bear, can be found south of here being attacked by a pack of rieklings. The Ritual of Beasts: Ease the Suffering of the Good Beast. The Skaal Test of Loyalty: You must complete a ritual for the Skaal in order to gain their trust. This location makes an appearance in the Dragonborn expansion of Skyrim. This page was last modified on 8 July 2013, at 15:09.